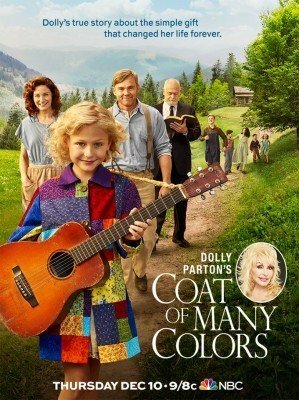 DOLLY PARTON’S COAT OF MANY COLORS is a wonderful TV movie on NBC about legendary country artist Dolly Parton as a child in the Smokey Mountains and an event that inspired her hit song “Coat of Many Colors.” DOLLY PARTON’S COAT OF MANY COLORS is delightful, with many moments promoting faith in Jesus Christ and forgiveness. Only a light caution is advised for brief, light foul language. Living in the Great Smokey Mountains in 1950, the Parton family struggles to get by like many other families in rural Tennessee, but they love each other dearly. Dolly, the second youngest of eight children, is a sweet and spirited 9-year-old with quite the singing voice. More than anything, she’s excited for her unborn baby brother, whom she considers and calls “my baby.” Dolly’s mother, Avie, makes the father, Robert, take the family to church every Sunday, even though he just stays outside during the service. One day, Avie goes into labor, and the baby is stillborn. This tragedy causes Avie to go into a depression. Dolly takes the death even harder, however, choosing to sleep outside by the baby’s grave and refusing to sing. After some time, Robert pleads with his wife to find the strength to overcome her grief, for the sake of Dolly who’s lost all joy. Avie decides to turn the baby blanket she was making into a brand new coat for Dolly. This makes Dolly ecstatic and excited. When the coat is finished, Dolly enthusiastically wears it to school. However, she’s bullied and told her coat is ugly. This revelation that her coat isn’t pretty devastates Dolly, who lashes out against her mother for making it and against God for taking away her brother. Will Dolly find faith again, and can she overcome her anger and bitterness? Will Robert let God’s grace into his heart? DOLLY PARTON’S COAT OF MANY COLORS is delightful and faith-inspiring throughout! Though some may consider it a sanitized reflection of its time and place, as a television special viewed by millions, it’s a refreshing celebration of the simple things that truly matter – faith, family and forgiveness. Alyvia Lind is sensational as the young Dolly Parton, and the other cast members are equally believable. Gerald McRaney plays the grandfather, who pastors the local church Dolly’s family attends. The movie suffers a bit from multiple storylines. Also, while there are positive portrayals of prayer, faith and worshiping God, the program’s final minute has a strange statement where Dolly Parton narrates she had to “ask for forgiveness from God” in addition to “forgiving God.” There’s also a scene where young Dolly yells angrily at God, though she repents of this in the end. While these things can be interpreted multiple ways, it’s worth noting that God’s sovereign will is perfect, and He can do no wrong against us, since everything he does is for our good, as Avie even acknowledges while quoting Romans 8:28. Best of all, perhaps, the movie discusses repentance, Christ’s resurrection and redemption in ways rarely seen on television. Only a light caution is advised for three rather light obscenities (one that’s rebuked), and an exclamatory profanity. Otherwise, DOLLY PARTON’S COAT OF MANY COLORS is a fantastic TV movie for the whole family. DOLLY PARTON’S COAT OF MANY COLORS is delightful and faith-inspiring throughout! Though some may consider it a sanitized reflection of its time and place, as a television special viewed by millions, it’s a refreshing celebration of the simple things that truly matter – faith, family and forgiveness. The movie discusses repentance, Christ’s resurrection and redemption in ways rarely seen on television. Only a light caution is advised for three rather light obscenities and an exclamatory profanity. Otherwise, DOLLY PARTON’S COAT OF MANY COLORS is a fantastic TV movie the whole family can watch together and enjoy.